When thinking of The University of New Mexico, many envision the white stucco tower of Mesa Vista Hall or the sprawling main campus bleeding into UNM Hospital. But 165 miles north, up a winding mountain road and nestled among the juniper trees near Taos, is a smaller, more unique and intriguing part of the UNM campus: the D.H. Lawrence Ranch. Now a group of UNM students are doing their part to raise awareness of the ranch, and increase accessibility. It’s all part of the Museum Studies class “Collections in Context: Taos”. “Many of these students are interested in doing historic site management, so to be able to take part in this professional assessment of the D.H. Lawrence Ranch was invaluable experience for them,” said Audra Bellmore, the professor who developed and teaches the class. The historic ranch is the final resting place of famed British writer D.H. Lawrence and his wife Frieda. 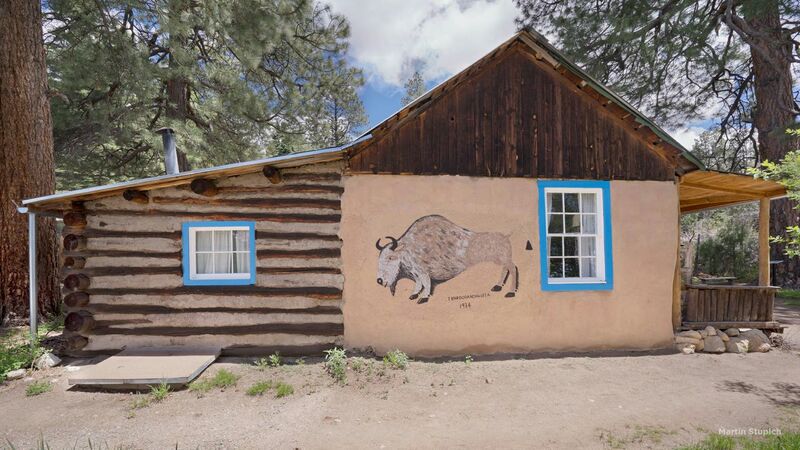 In 1924, the two first ventured to the American Southwest at the invitation of their friend Mable Dodge Lujan, who was looking to create an art and writing community deep in the mountains of New Mexico. True to the state’s nickname, it enchanted Lawrence – inspiring him to write such notable works as The Plumed Serpent and St. Mawr. But he was not the only one stricken by the beauty of the 160-acre ranch. Hidden among sagebrush, scrub oaks, cottonwoods and aspens, the property was formerly called Kiowa Ranch. It started as a campsite along an ancient path of the Kiowa Indians, before gold miners built the typical frontier-style two room cabin. Sprawling pastures spread out in the foreground, while forests frame it from behind. Lawrence used to sit and write under a massive ponderosa pine not far from the cabin, inspiring Georgia O’Keeffe’s painting “Lawrence Tree” in 1929. Prior to visiting the ranch, students read those works written by Lawrence during his time in New Mexico. They say being able to visualize the landscape he was describing really helped them contextualize the writings. About ten percent of the ranch (16 acres), including the cabin and several other structures, were added to the National Register of Historic Places in 2002; which enables state and national funding to be used to retain the historic significance of the site. But before anything can be done – the property must be inventoried, and every piece cataloged for reference. campus, the Center for Southwest Research and Special Collections and the UNM Regents Historic Preservation Committee. In addition to assisting the class, Center for Southwest Research will also host an online inventory with photographic documentation of the site. The assessment report will be completed later this summer, and will be passed on to the UNM Regent’s Historic Preservation Committee and the Institutional Support Services Division. Bellmore says the hope is that the ranch can eventually become a more integrated UNM workspace, and a real-life lab in which students can interact with history.